n a brand new Apple iTouch, courtesy of Grande Communications. 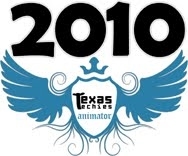 Over 100 Corpus Christi area school children registered for the competition and spent the past two months creating their own animations, games, stories, art and music for submission to the Texas Techies Animator 2010 competition. 43 projects were successfully submitted and qualified in the semi-finals. 10 students made the final cut and were selected as the finalists.